Once scientists got to the point where they could sequence many, many genes and compare the genes in one organism directly to the genes in another organism, it was thought that a “definitive tree of life” would be produced. After all, since evolution is supposed to occur via mutations in the genome being acted on by natural selection, genetics should provide a clear map of how evolution progressed. The problem is that DNA has simply muddied the waters even more when it comes to evolutionary relationships. 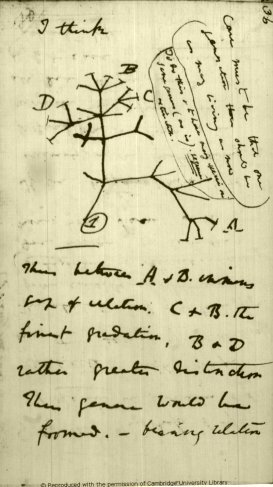 Indeed, it has caused some biologists to say that evolution cannot even be represented by a tree. So the “trees” produced by genetic analysis differed depending on the gene. In only three of the 33 genes could they reproduce the RNA “trees” that had already been established, and they couldn’t even decide which of the two bacteria came first! Now, of course, bacterial genetics can be hard to understand because bacteria “swap” genes all of the time. Bacteria can even “pick up” genes from a dead bacterium of another species through a process called transformation. Thus, it might not be all that surprising to find that it is difficult to “tease out” the evolutionary relationships of bacteria, as all that gene-swapping would blur any genetic relationships. The second problem, which I consider to be even more serious, is that very similar genes show up in animals that no evolutionist wants to believe are closely related to one another. For example, two studies published in Current Biology, 5,6 show that the hearing gene (Prestin) is very similar in bats and bottlenose dolphins. No evolutionist would suggest that there is a common echolocating ancestor between these two organisms, yet if that gene were used to construct an evolutionary “tree,” it would most certainly show that they have a recent common ancestor. So despite the fact that the Pax-6 gene is incredibly similar among many animals with eyes, we cannot assume these animals all had a common ancestor with eyes. Indeed, Mayr suggests in the same discussion that evolutionists believe eyes have developed in 40 independent evolutionary lines. Furthermore, we have to assume that the Pax-6 gene had some “unknown” function in organisms without eyes, but it was then “recruited” for eye development in organisms that developed eyes. We have no evidence at all that the tree of life is a reality. 8. Ernst Mayr, What Evolution Is,Basic Books, 2001, p. 113. On a taxonomic streak are you? Well, you’re right. Yup, there is plenty of disagreement on the “tree” of life, and even scientists who have used a “bush” as a much more apt metaphor for a long time have seriously different ideas about what the big picture really is. Even the entire fields of cladistics and systematics have significant disagreements both between and among each other. There are even different definitions of “species”! That’s quite a lot of disagreement. Doesn’t sound like a High Priesthood at all, does it? But none of that makes evolution by natural selection any less true. Btw, how do you argue on one hand that evolutionists follow their dogma like a religious order and thus are not practicing science AND on the other hand, criticize evolutionists for revising previous information and disagreeing? Which one is it? Actually, it sounds JUST like a high priesthood. You see, rather than following the data, the high priests of evolution decide on certain dogma. If you don’t question that dogma, you are free to argue about the fine points. However, if you question the dogma you are excommunicated. So you are free to argue about the MECHANISMS of evolution – you are just not allowed to doubt the DOGMA that evolution happened. Of course disagreement amongst evolutionists doesn’t make evolution any less true. What makes it clear that evolution is not true is the fact that the DATA disagree with the predictions of evolution – especially the data that come from DNA! As explained above, evolutionists act like any other high priesthood. You are allowed to disagree on certain details (like groups within ANY church do). You just can’t disagree with the dogma. How do you tell the difference between dogma and settle science? It’s very simple – the proponents of settled science aren’t afraid of debating what they consider settled science. Given that many evolutionists are terrified of debating the reality of evolution, it is clear that evolution is more dogma than science.